Chemists in Korea and the US have come up with a method to create catalysts known as zeolites with a hierarchical range of pore sizes, making way for the reaction of larger molecules than ever before. According to the researchers, the new zeolites could be used in the petrochemical industry to crack oil, or in organic synthesis. Zeolites - crystalline materials with dense internal networks of pores - are one of the most widely used catalysts in the chemical industry today. They are used for applications as diverse as water purification, trapping nuclear waste and cracking heavy oil into shorter hydrocarbons. However, the catalytic applications of zeolites to date have been limited to smaller molecules: zeolite pore mouths tend to be smaller than 0.8 nanometres, so molecules larger than this cannot enter. Past decades have seen many research groups attempt to overcome this restriction. One method, developed in the late 1990s, is to reduce the zeolite crystal size to single layers, which can be stacked like a house of cards to improve accessibility for different reactants. Unfortunately, these zeolite layers often collapse during synthesis. Another method, also developed in the 1990s, is to create mesoporous materials - those with pores bigger than 2nm - using clumps of surfactant molecules as templates for the pores. But the walls of these materials are not crystalline like zeolites, so their catalytic ability is not as good. 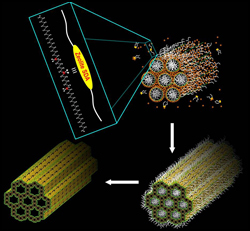 Now, Ryong Ryoo at the Korea Advanced Institute of Science and Technology and colleagues have made similar mesoporous materials with walls made of crystalline zeolites. The researchers use surfactants based on two long alkyl chains linked by ammonium groups as the template. As these surfactants clump together, they form the basis of the mesopores. Meanwhile, the ammonium groups allow for the crystallisation of zeolite layers with smaller micropores. 'Synthesis of zeolites with mesopore-micropore hierarchy using functionalised surfactants is a new concept in the zeolite science field,' says Ryoo. Avelino Corma, an expert in zeolites at the Polytechnic University of Valencia, Spain, thinks it is not yet clear whether the new system by Ryoo's group will work better as a catalyst than the previously developed house of cards system. However, he does call it an important step. 'The work represents a clear step forward in zeolite synthesis and has been shown to present interesting catalytic properties,' he says.